Named after the Ancient Greek city-state of Corinth from where the style originated, this Corinthian helmet would have been worn by a hoplite soldier, both in and out of combat. Its distinctive shape, with a bell-like crown, almond eyes, teardrop nose plate and long cheek plates which taper to two points with a thin gap, is particularly archetypal for this style of armour. Skilfully beaten from a single sheet of thick bronze, the helmet has an elegantly formed brow ridge that curves round to a flared neck plate at the rear to protect the soldier’s nape. The combination of the firm shape at the front and rear of the helmet meant it could be worn pushed back on the forehead to reveal the face of the wearer when not in combat, whilst remaining fixed to the head. As frequently depicted on Greek pottery, the Corinthian helmet was often worn pushed back on the head for comfort as the small size of the openings at the front of the helmet would have obstructed the wearer’s critical senses. Over time the practice of wearing the helmet pushed back became a tradition that represented the military prowess of its owner. Whilst more open-work helmet styles such as Thracian and Chalcidian examples became popular for combat, the Corinthian style became emblematic of a proud Greek military ideal. The style is depicted on Greek sculpture more than any other type of helmet in Greek art, highlighting this romantic association between the helmet type, and a history of glory and conquest. As the Romans adopted earlier Greek styles of bronze and marble sculpture, they similarly appropriated the symbolic importance of the Corinthian helmet and it adorned statuary of many important Roman military leaders. The Greek fifth century author Herodotus, who is known as the ‘Father of History’, discusses the Corinthian helmet style in his work Histories. He describes how two tribes living in ancient Libya held an annual competition where teams of females would enact a ceremonial battle to honour the goddess Athena, while dressed in the Corinthian helmets. Athena, the Greek goddess of warfare, was herself often depicted on coins and statues wearing a plumed Corinthian helmet pushed back upon her head, strengthening the association between this helmet type and divine conquest, while also providing archaeological evidence to illustrate how the helmet was both often worn, and adorned with feathers. This example is in particularly fine condition, with harmonious proportions, elegant symmetry and a rich patina that had developed over the years. 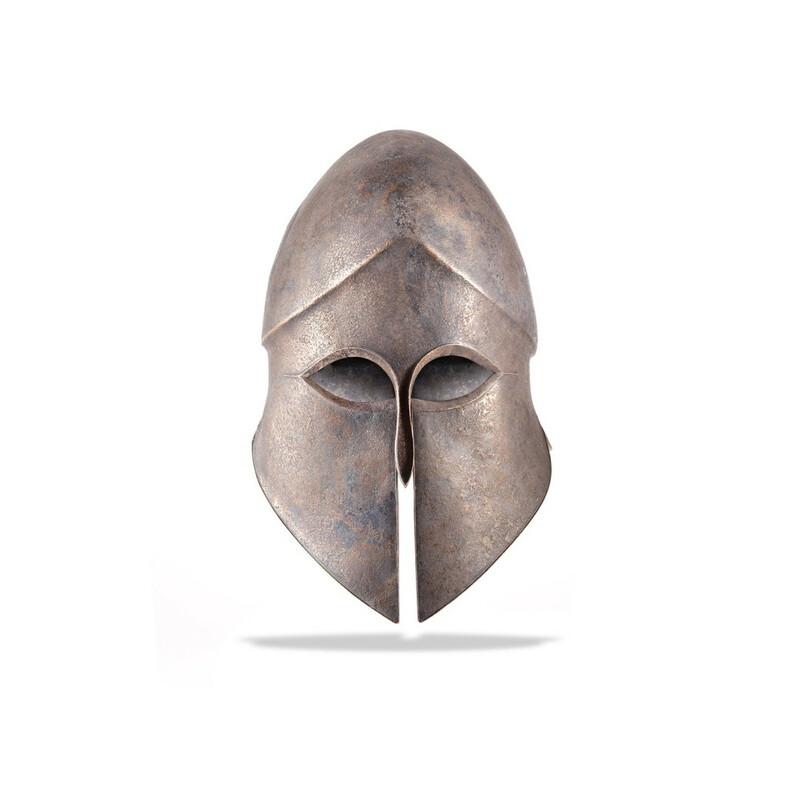 Highly evocative of both ancient Greek warfare and a fascinating Classical iconographical tradition, it is an object that has been synonymous with the two for thousands of years. The simplicity of this example, with its unadorned surface, suggests an understanding of minimalism whilst allowing the beautiful proportions of the shape to speak for itself as a work of design. Corinthian helmets can be found in the collections of many major museums across the world, including the Louvre in Paris and the British Museum in London, which holds at least twenty examples in various states of survival. The most similar parallel to this helmet however can be found in the permanent collections of the Staatliche Antikensammlungen in Munich, which holds one of the most important collections of antiquities in Europe. Thought to be from a Greek workshop in Southern Italy and dating to around 500 B.C., the Staatliche Antikensammlungen example was recovered during the excavations of a tomb for an important warrior named Denda.The incredible similarities between the Munich helmet and this example suggest a similar origin and date for ours. It also provides evidence for the idea that our helmet may have once been interred upon the head of an important ancient Greek warrior, which would explain its excellent condition. T. Everson; Warfare in Ancient Greece, The History Press, 2008, p.135. J.J. Pollitt & O. Palagia; Personal Styles in Greek Sculpture, Cambridge University Press, 1999, p.32. Previously in the Private Collection of of Mimi and Ludwig Beumer. German Art Market (accompanied by German Export License).